There are a number of ways to listen to, and download music using your MAC for free. The best ways to do this include basic video link copy and pasting, with conversion, or simple video streaming. A few of the best programs to download free music for MAC with, includes the MP3 Grabber, Apowersoft Streaming Audio Recorder, iTunes, and Jamendo. All of these programs are free to start using and completely legal to download music from. For the best free music downloader for MAC this online tool will do the trick. Simply open two browser windows, visit YouTube, search the video of your choice, then copy and paste the video link into the allotted search area on the MP3 Grabber website. Next, you are free to customize the outputted audio settings like Output format, Bitrate, Channels and Sample rate. Now, the only trouble with using this source to download free music online for Mac is the fact that not all music available can be found on YouTube. Therefore, you will be limited when attempting to download free music online through this program. Yet, it is completely free and will require no registrations or future fees. Apowersoft Streaming Audio Recorder is ultimately the most convenient and affordable way to go. All you have to do is install this software to your MAC, and then you can download free music for Mac instantly. There is even a free trial period, where the program will be completely free to use as you wish. In addition, you can use Streaming Audio Recorder to record music from all music sites, as well as online radio stations to your MAC for private use. It supports audio formats, such as MP3, WMA, AAC, OGG, and many more. It also has the function of Video to MP3, which gives you the capabilities to download both audio and video from YouTube at any time. These capabilities make Apowersoft Streaming Audio Recorder the best free music downloader for Mac. They also give this program its cutting edge as an all-in-one tool, combining all of the programs and websites listed above into one easy to use power recorder. iTunes provides a wide variety of music for music lovers. You may even say that almost every song out, on the radio today, can be found on this website. However, not every song has the free download option for MAC. iTunes is known for its music store. 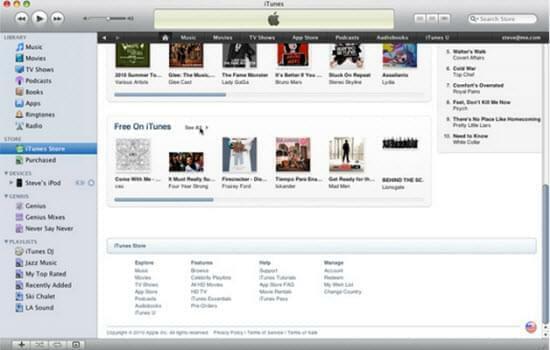 Therefore, how to download free music on Mac with iTunes? In fact, there is a limited amount of free music to be downloaded, here. All you have to do, though, is access their website and search free music. If you find the music you like for free, simply select it and download it. Otherwise, there will be a charge per selected song to be downloaded from this website. To be completely honest, Jamendo is one of the best free music download sites for Mac, but may be also the most confusing website to navigate, between all of these free music download options. There are a huge number of music selections to choose from, here. However, you cannot download more songs unless purchasing their upgraded services.